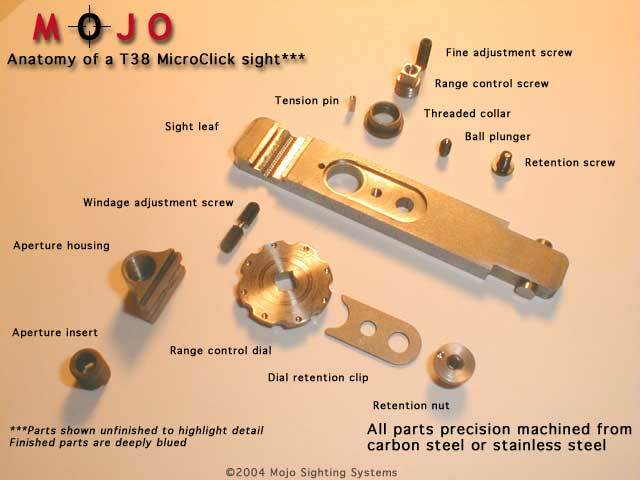 Mojo's revolutionary new MicroClick(TM) sight!!! As you can see, this is the genuine article. No plastic or aluminum parts here. Just cold-rolled steel, engineered and machined to last for the life of your rifle. Designed for the competion shooter (or anybody else who wants the finest), the MicroClick sight offers range adjustments in precise, repeatable .7-.8 MOA increments. Simply turn the dial to take out your target, whether it's at 100, 300, even 600 yards! That advance, coupled with our new replaceable apertures, can turn your fine military surplus arm into a match-winning competitor or trophy-bagging field gun. All without lessening its collector value! Available for 98 Mausers, Swedish Mausers, Mosin Nagants, Finnish Nagants, Swiss K31/K11, SMLE, AK and SKS. Guaranteed for life!